Something a little different this time. News and updates about Gasnet itself. A “state of the union” episode if you like, together with some thoughts on where I see the service evolving over coming months. I intend to create one of these episodes about every year or so. The last state of the gasnet post was a blog post on our website at www.gasnet.tv in December 2013 so its time for a review. Direct link to the signup page via http://www.gasnet.tv/list where once subscribed you will also have access to a web based archive of post discussion. Technical issue with our list server means archives prior to April this year are currently unavailable but as soon as resolved (work in progress by our hosting company) every pearl of wisdom back to 2010 will be available for you to read. As of August 2015 we have 128 members, an increase of 10% or so from our last state of the Gasnet post. Current list members should ‘tell a friend’ about the list and get them to subscribe. Membership growth isn’t an end in itself but we all value a diversity of opinion from all over the globe so please go out and tell the next Anaesthetist you meet to go to www.gasnet.tv/list and join the discussion. Rallying point for all Gasnet related activities online. The site can also be accessed via www.gasnet.news. Mobile friendly version for those addicted to their smartphones and tablets. Google+ is Google’s interest based social network, requiring a Google services login to join. Not necessarily a gmail address, but a valid Google account. I require participants to have their occupation as an Anaesthetist in their Google public profile or to let me know their relationship with Anaesthesia via a private message. Anaesthetists have to ‘like’ the page to receive updates. Used primarily for announcements eg of new podcast episodes or services. Nearly half are listening to the podcast on the website itself rather than subscribing. Content to now has been based on the presentation I hosted last year called the ‘Socially enhanced Anaesthetist’. The full presentation is available on the gasnet youtube page. I took over gasnet list administration duties at the end of 2010 with an aim to both keep what was good about the old email discussion list and explore some of the possibilities of social media. 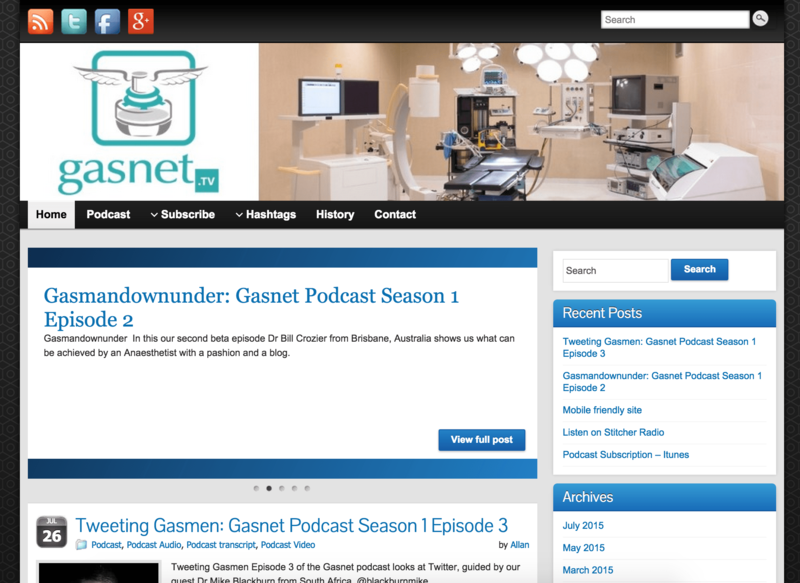 To that end I think Gasnet has now become a social platform, a gathering spot for Anaesthetists online. A virtual theatre tea room. Much is still a work in progress. But its a good start. All facets of Gasnet could benefit from more participation. A slow steady growth over the next year or so would be beneficial so to that end which ever aspect of the platform you enjoy most, go tell a friend about it, blog about it, tweet it or post it on Facebook. Gasnet has no external funding. I pay for the servers and various license fees out of my own pocket and donate my time freely. This allows us to be independent of any external influence. It does however sometimes limit speed of progress. All I ask in return is for Gasnet participants to equally give of their time by active participation. I’m not AGAINST funding for any specific project, but at the moment I don’t see funding on our particular road map.